I have so many fabulous memories of our wedding. It was a gorgeous August day, my mother choked up when she saw me in my wedding dress, my sister cried almost as hard as I did while I said my wedding vows, my dad told me I was the most beautiful bride in the entire world, and when I looked deep into my husband’s eyes as I said, ‘I do’, I knew that marrying him was the best decision I would ever make in my entire life. I couldn’t have asked for a more picture-perfect day, and while a few things went wrong leading up to the big event (the chef from the venue quit, my face broke out worse than a 13-year-old girl’s, and our cake decorator completely dropped the ball on the fabulous creation he promised us), absolutely NONE of it matter the day of. I was so full of excitement that the people I loved most were there to witness the most important day of my life that NOTHING could bring me down. I did have one Bridezilla moment. And it was 100% my fault. All of my married friends warned me that I should put together a collection of at least 3 wedding hairstyles I liked, and book at least one trial run with my hairdresser, but since we were getting married out of town and I wanted a simple French twist, I really didn’t see the point. But then my wedding day rolled around, and despite all of the instructions I gave to my hairdresser, she just couldn’t seem to understand what a French twist was (?!?!?! ), and after 3 failed attempts at doing something ‘simple and elegant’, I came THIS CLOSE to hyperventilating into a paper bag. Thankfully, my mother waltzed in at that exact moment, took one look at the monstrosity that was my hair, said something in a low voice, and within 20 minutes my hair looked EXACTLY how I had envisioned it would. So if I can give any advice to all of the brides, maid of honors, and bridesmaids out there as we move into wedding season, it’s this: make sure you do your research and have a collection of wedding hairstyles at the ready, and never underestimate how important the mother of the bride is on the big day. 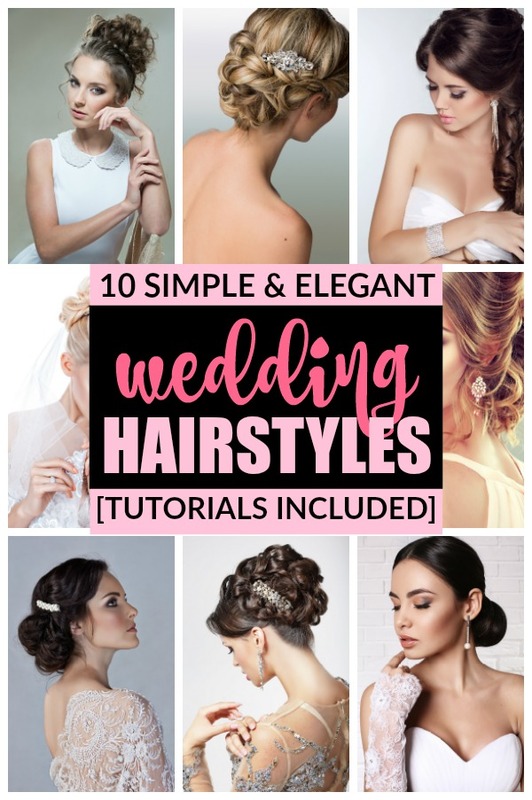 From a Classic Bridal and a Soft Curled Updo to an elegant Half-Up Half-Down and Vanessa Hudgens Glam-Inspired look, these simple and elegant wedding hairstyles are just what you need to look (and feel!) your best. Need a good curling wand to help pull these looks off? I highly recommend the Hot Tools Flipperless Curling Wand – best purchase I’ve ever made! If you liked these wedding hairstyles, please share them on Pinterest! And if you’re looking for more hairstyles to keep your locks looking their best year-round, please follow our Hair board where we share all kinds of great ideas!